Ideal, dependable daysailer in open and cuddy models. Optional hinged mast makes her an ideal trailer-sailor that can be launched, and ready to sail in minutes. US Sailing recognized one design. Daysailer/weekender offering a spacious, self bailing cockpit and roomy cabin unrivaled by any boat of similar length. Also available in an open cockpit model for comfortable sailing with a large group. Expand your cruising grounds with this shallow draft sea-kindly vessel with classic looks that will turn heads in any harbor. The M-22 is roomy enough for a family of four, with amazing accommodations. Doubled ended daysailer with a shoal draft and graceful shear line designed by Joel White. Perfectly balanced, she handles easily in a variety of conditions. Added to the Marshall fleet in 2011. This popular size is perfect for anyone wanting a solid, stable, daysailer. With similar seaworthy characteristics as the larger cats, she has proven to be ideal for worry free performance, dependability, and ease of handling. The Sanderling is a common sense daysailer/weekender offering a spacious cockpit and roomy cabin unrivaled by any boat of similar length. Easy to single hand, sail with kids, or sail across the bay with four or five friends. Here is the perfect boat to expand your cruising grounds. She is a rugged, sea-kindly boat with classic looks that will turn heads in any harbor. Marshall Marine has acquired the molds and building rights to the Sakonnet 23, formerly built by Edey & Duff out of Mattapoisett. 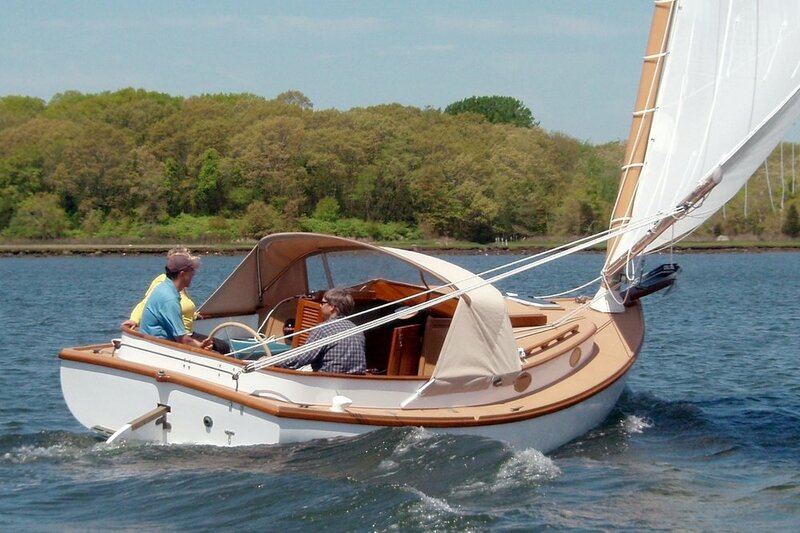 This is a classic Joel White designed daysailer, with a shoal draft similar to our catboats. Marshall Marine offers brokerage service for all Marshall Catboats and Sakonnet 23 Sloops.